Orientation columns in the primary visual cortex are known to have (mostly) simple cells in layers 4 and 6, and (mostly) complex cells in layers 2,3 and 5. Orientation columns spanning an entire range of orientations (0-180 degrees) are “grouped” into ocular dominance columns. My question: Ocular dominance columns are monocular columns, corresponding either to the contralateral or the ipsilateral eye. Complex cells, however, are binocular. How do these two things go together? 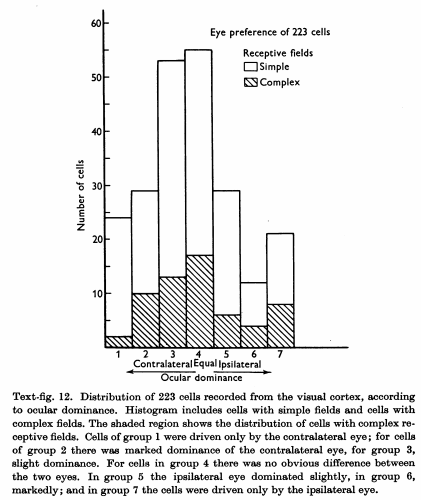 Ocular dominance columns are not purely monocular, nor are simple cells purely monocular. Hubel, D. H., & Wiesel, T. N. (1962). Receptive fields, binocular interaction and functional architecture in the cat's visual cortex. The Journal of physiology, 160(1), 106-154. Not the answer you're looking for? Browse other questions tagged neuroscience vision neuroanatomy or ask your own question. Is there a region of cortex which over a period of development becomes the seat of self? What are biologically plausible ways to model binocular disparity? What is the relationship between neurotransmitter release and resting potential in retinal bipolar cells? Are the receptive fields of bipolar and retinal ganglion cells directly stimulated by light?